It seems tidying up has become an obsession lately. Maybe it’s the spring like weather, or that I’ve finally had enough and am ready to throw out a few things. Whatever the case may be, tidying up has now carried over to my computer, and has become the latest cleaning project for me. 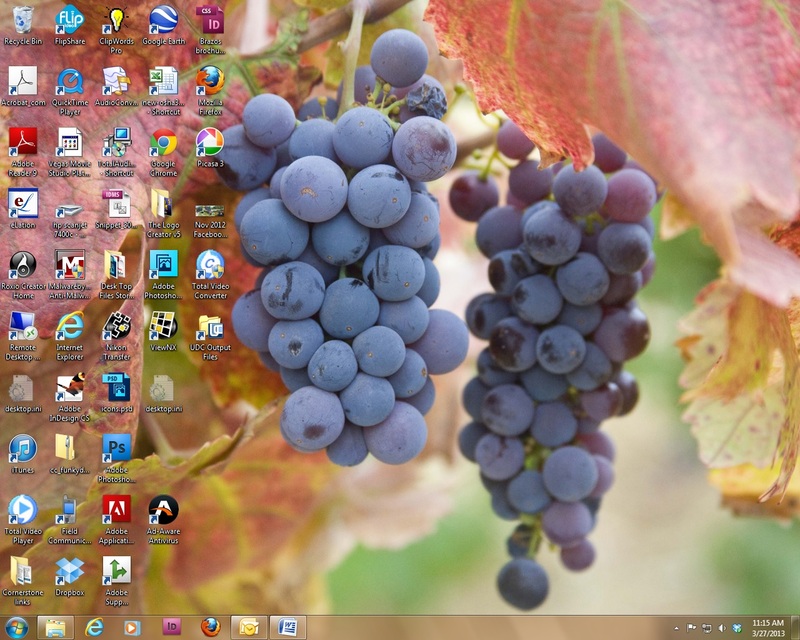 If your desktop (your computer screen) is as cluttered as mine is…..let’s just say, you will need to tidy it up a bit. 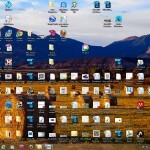 One quick way to do this, especially if you are having trouble letting go of some of those files, is to create a desktop folder and just place them there. You know, it is like stuffing everything in your hall closest. It’s out of site for the time being, and makes the room look a little cleaner. 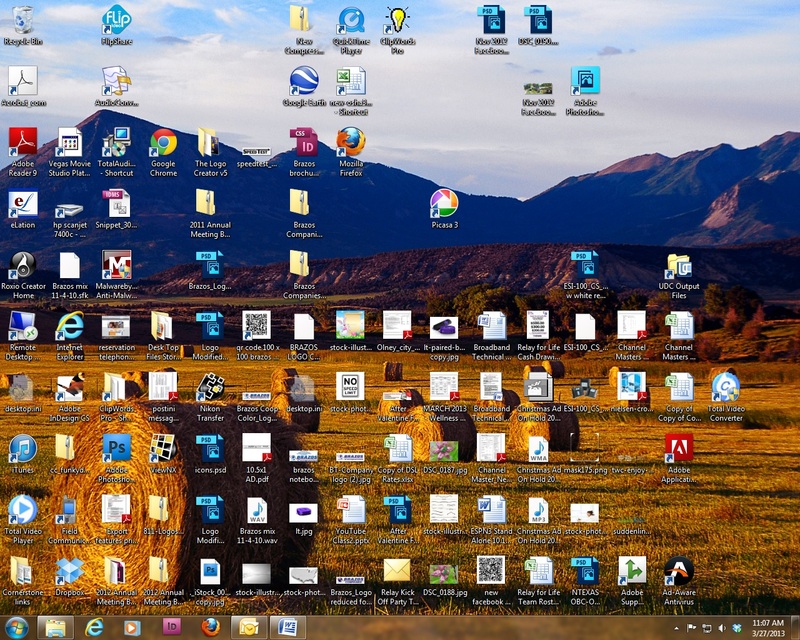 Note: If your computer screen has more than 10 different icons on it……well okay, 43 icons, you just might be a desktop hoarder….I’m just saying. 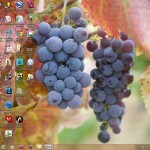 Step One: Create a desktop folder – To create a folder, you will need to click on the Start button located on the lower left corner of your desktop. Next select My Computer, then Desktop. It may be necessary to click on the drop down arrow in order to find Desktop. This will show you all the files located on your desktop, along with an option to Create a New Folder located on the top menu bar, or in the column on the left hand side of the screen. Step Two: Select Create a New Folder, then Name the Folder. For example, you could name it Desktop Overflow, and press enter. Once this is done, you are ready to start dragging files to the new Desktop Overflow file folder. Step Three: Open the new folder by double clicking on it. You will notice there are no files located in the folder. To place files in the new folder, simply click on the icon, picture, or file on your desktop and drag it to the open folder by holding down the left mouse button as you drag. You will see your icon, picture or file in the new folder. Continue to click and drag all the files you want moved to the new folder. Close the folder when done. The Desktop Overflow folder will now be an icon/file on your desktop which you can double click on to open and view the files you have saved there. Now, until some point in the future when you are ready to really tidy up and move those files to their proper places ….like My Documents, My Pictures etc., your desktop will look a little cleaner. To learn more tips and tricks about your computer, or how to navigate the web, click here to view our Website Compass Magazine ….The World’s #1 Website Magazine. To learn more about high-speed Internet from Brazos, visit our website at www.brazosnet.com or call 1.800.687.3222.